Himself the subject of one of the bigger “fake news” stories in 2016 and targeted again in 2017, Pope Francis dedicated his message for the 2018 World Communications Day to this growing phenomenon. He takes on the troubling topic in ways part obvious and part provocative. Setting aside the worthwhile journalistic debate, the pope’s analysis opens a bigger window on the subject. As much or more than a professional concern, fake news can be a prominent matter in interpersonal communications. Everyday conversations also contribute to the spread of fake news whenever we complain about, gossip with, or mock others. St. Francis de Sales, on whose feast day the pope’s message was published, addresses the virtuous character of ordinary speech in his Introduction to the Devout Life (part III, chapters 26-30). His advice there reflects the same relational approach to truth that informs the pope’s message. Today, we refer to fake news as what we see in print or on screen. It proliferates through the manipulative powers of new media. But it begins with the one who writes or posts, in how we think and speak. For the saint, we are its source, since “our words are the true indicators of the condition of our souls.” For the pope, we are also its remedy. “The best antidotes to falsehoods are not strategies, but people: people who are not greedy but ready to listen, people who make the effort to engage in sincere dialogue so that the truth can emerge; people who are attracted by goodness and take responsibility for how they use language. Between the two Francises, this is truth. And it’s news worth sharing. 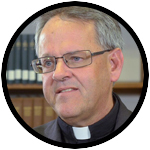 Father Dailey is the John Cardinal Foley Chair of Homiletics and Social Communications at St. Charles Borromeo Seminary, Wynnewood. NEXT: Should you have more money in bank before you have more kids? Father Tom, Well written article and so very well needed advice in today’s world, my old friend! The pope says “We can recognize the truth of statements from their fruits: whether they provoke quarrels, foment division, encourage resignation; or, on the other hand, they promote informed and mature reflection leading to constructive dialogue and fruitful results.” … but through Amoris Laetitia, the pope himself has provoked quarrels and fomented division, and will not provide responses to the questions posed by respected holy men and women … a bit hypocritical maybe?